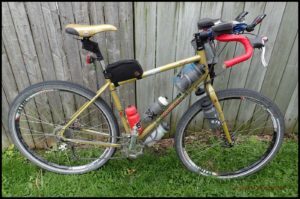 Wolf Tooth B Rad System: Quick Review- by Guitar Ted When it is hot and windy, the battle against the elements that a gravel rider faces is a tough one. A big facet in overcoming the obstacles presented by the weather is having a plan for effective hydration. However; many riders don’t like having to carry their hydration supply on their backs. The packs used can create heat on a rider’s core. Right where you don’t want it. Then there is the beat down you can get from carrying all that weight on your backside as you ride less than smooth roads. That’s where Wolf Tooth has come in with a solution in their B Rad System. It is a way for you to expand the capabilities of the braze ons your bike already has. Be that for water, gear, or both. 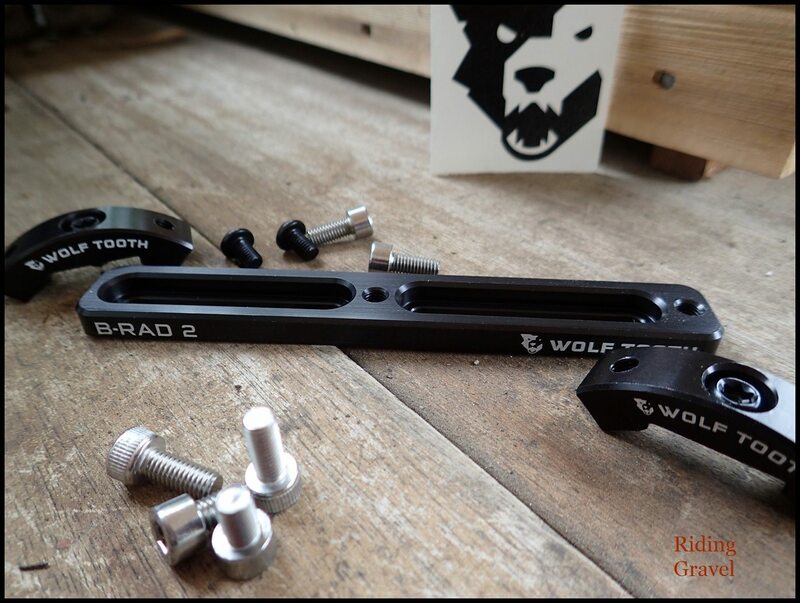 Wolf Tooth’s B Rad base mount 2 and Double Bottle Adapter kit. Recently I took a trip to the Kansas Flint Hills region and rode a century there. 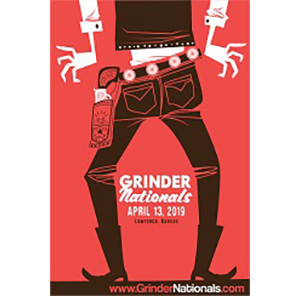 Many of you are aware of the Dirty Kanza 200 event, but what you may not know is that this region has its remote places, is a windy area, and it can get rather hot down there in early June. I have been roasted by wind and heat in the Flint Hills before, so I was wanting to expand my capabilities to carry water, but I refused to do that via a hydration pack. That wasn’t an option for me because I get far too hot wearing any of the designs I have tried. The B Rad 2 and Double Bottle Adapters are adjustable for position, so you can achieve the optimum set up for your bike. That’s why the B Rad 2 and Double Bottle Adapter caught my eye. Added to my trusty Salsa Cycles Gen I Fargo, I could sport seven water bottles, all mounted to my bicycle and not have to carry any water on my back. 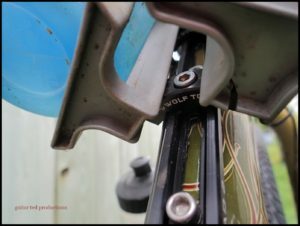 The B Rad System works to allow me to do this by mounting the rail to a set of my bike’s water bottle bosses. Then, the Double Bottle Adapter brackets mount to the B Rad 2 rail. The adapter then can accept two water bottle cages where once you could only mount one bottle. The B Rad 2 rail is slotted generously so that you can position it in such a way as to not interfere with your legs or other things like frame bags or the like. With my Gen I Fargo having two down tube mounted bottles on the inside of the main triangle, I chose the upper set of bosses to mount the B Rad 2 rail. This gave me copious amounts of room for my legs whether I was seated and pedaling or standing and mashing. There are other B Rad rails which may allow for better placement of bottles on other bikes as well. I chose the shortest rail since I had the arrangement on the Fargo that suited that choice. The B Rad 2 rail comes with hardware to mount it and weighs 39 grams on my digital scale including the bolts supplied. The Double Bottle Adapter also comes with the two brackets which fit over the B Rad 2 rail like puzzle pieces. Hardware is also included with the adapter brackets. In total, the Double Bottle Adapter and included hardware weighs 29 grams. The B Rad System is modular, so the adapter and rails are sold separately. The Double Bottle Adapter sells for $23.95 USD and the B Rad 2 rail sells for $17.95 USD. Mounting is straight forward and everything fit together nicely. I used a bit heavier duty hardware than the aluminum bolts supplied with the Double Bottle Adapter to mount the adapter brackets to the B Rad 2 rail, but otherwise the supplied hardware was perfect for the job. I mounted two Velocity Bottle Traps to the Double Bottle Adapter with no issues. Then it was time to ride! The Gen I Fargo with the B Rad System bits in place. At The Finish: The 103 mile ride in the Flint Hills happened on a near perfect day, so my “test” of hydration readiness was not too severe. However; the test for the B Rad System was about as tough as it gets. I encountered several sections of wash board, really rocky roads, big chunks of exposed bed rock, and I slammed a pot hole at about 30 miles per hour. Not that I wanted to hit that pot hole, but if the B Rad System can hold my two water bottles after that hit, I was convinced it would hold up to a lot more abuse. In use, having the bottles mounted as they were on the Fargo allowed easy access to the bottles and yanking them out of the Bottle Traps, (and you have to tug pretty hard to get a bottle out of a Bottle Trap! ), yielded no looseness or wimpy feelings in regard to the B Rad’s strength. The system performed rock solid and steadfastly throughout the ride. I’m keeping the B Rad System around and I am confident it could hold up to a long trip on most any terrain with ease. The B Rad System also offers a strap to carry tool kits or gear and Wolf Tooth says more accessories are coming. Stay tuned for what those might be. However; for expanding the capabilities of your bike to carry water bottles, I can say that the B Rad System works well and is highly recommended. For more on the Wolf Tooth B Rad System see their web page here. Note: The B Rad System and Double Bottle Adapter was purchased by Guitar Ted for his personal use. This review was not paid for nor were we bribed for Guitar Ted’s views on this product. We strive to give our honest thoughts and opinions here at RidingGravel.com. What is it that you have on your handlebar, as a TT bar? I’ve got an insane metabolism for a nearly 40 year old so most of my frame space is taken up by bags with food. These would help me carry bigger bottles and look sturdier than the di2 battery adapters I’m using now. How has the B-Rad system working on the Fargo? Any problems with knee clearance? @Thomas J- No issues with clearances whatsoever. I really have been pleased with how it has made the Fargo more versatile and how it has increased water capacity.